[264 Pages Report] The UAV market was valued at USD 18.14 Billion in 2017 and is projected to reach USD 52.30 Billion by 2025, at a CAGR of 14.15% from 2018 to 2025. The objective of this study is to define, describe, segment, and forecast the UAV market based on UAV type, application, class, system, mode of operation, range, point of sale, MTOW, and region. 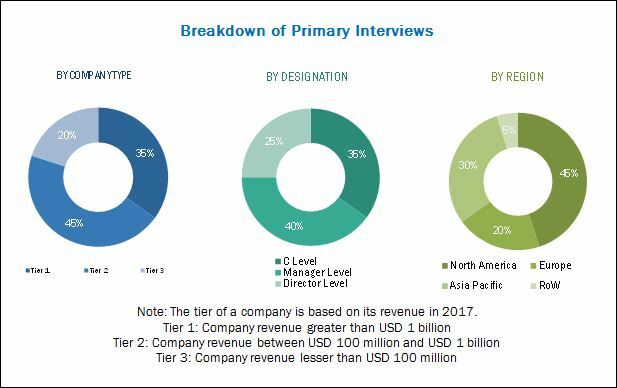 The report provides a detailed overview of the competitive landscape of the UAV market and profiles of companies based on their financial positions, product portfolios, and growth strategies adopted by them to sustain their position in the market. It also analyzes core competencies of key players and their market shares to anticipate the degree of competition prevailing in the UAV market. The report also tracks and analyzes competitive developments, such as partnerships, mergers & acquisitions, new product launches, and research & development activities. The base year considered for this study is 2017 and the forecast period is from 2018 to 2025. The UAV market has been segmented on the basis of UAV type, application, class, system, mode of operation, range, point of sale, MTOW, and region. General Atomics (US), Northrop Grumman (US), Textron (US), Boeing (US), DJI (China), Parrot (France), 3D Robotics (US), and Aeryon Labs (Canada) are key players operating in the UAV market. Contracts, new product launches, agreements, and acquisitions are major growth strategies adopted by key players in the UAV market. 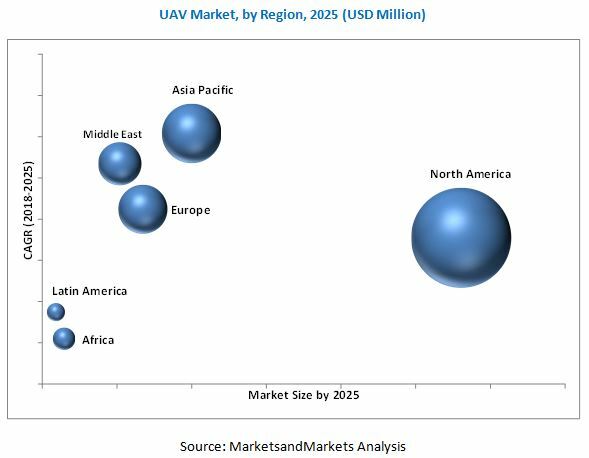 The UAV market is estimated to be USD 20.71 Billion in 2018 and is projected to reach USD 52.30 Billion by 2025, at a CAGR of 14.15% from 2018 to 2025. Rise in the procurement of military UAVs by defense forces worldwide is one of the most significant factors projected to drive the growth of the UAV market. The increasing use of UAVs in various commercial applications, such as monitoring, surveying and mapping, precision agriculture, aerial remote sensing, and product delivery, is also contributing to the growth of the UAV market. The UAV market has been segmented on the basis of UAV type, application, class, system, mode of operation, range, point of sale, MTOW, and region. Based on range, the UAV market has been classified into Visual Line of Sight (VLOS), Extended Visual Line of Sight (EVLOS), and Beyond Light of Sight (BLOS). The Visual Line of Sight (VLOS) segment of the UAV market is projected to grow at the highest CAGR from 2017 to 2022. This growth can be attributed to the increasing use of VLOS UAVs in commercial and consumer applications. Based on application, the UAV market has been segmented into military, civil & commercial, homeland security, and consumer. The civil & commercial segment of the UAV market is projected to grow at the highest CAGR from 2017 to 2022. This growth can be attributed to the increased adoption of UAVs for various civil & commercial applications, such as monitoring, surveying, mapping, and remote sensing. Based on class, the UAV market has been segmented into small UAVs, tactical UAVs, strategic UAVs, and special purpose UAVs. The small UAVs segment is expected to grow at the highest CAGR during the forecast period, owing to the demand for these UAVs from the defense sector for surveillance and reconnaissance applications. The demand for small UAVs from the commercial sector is also increasing, as these UAVs are used in agriculture, wildlife survey, search & rescue operations, firefighting, law enforcement, photography, and disaster management. Based on region, the UAV market has been segmented into North America, Europe, Asia Pacific, the Middle East, Latin America, and Africa. North America is estimated to be the largest market for UAV in 2018. The increasing use of UAVs for border and maritime surveillance activities in countries, such as US and Canada, is driving the growth of the UAV market in North America. Lack of proper air traffic management for UAVs and issues with the safety and security of UAVs are acting as key challenges to the growth of the UAV market. Major companies operating in the UAV market include General Atomics (US), Northrop Grumman (US), Textron (US), Boeing (US), DJI (China), Parrot (France), 3D Robotics (US), and Aeryon Labs (Canada). New product launches and supply contracts were among the key growth strategies adopted by leading players in the UAV market from 2012 to 2017. SIR, HOW DO YOU FORESEE THE GROWTH OF HEAVY CARGO/PASSENGER UAVs IN INDIA AND NEIGHBOURING COUNTRIES. With upcoming India UTM regulations in place for BVLOS UAVs, the expected market potential in short term would be for Light Cargo Delivery Drone especially e-commerce, retail, food delivery etc. The market growth for heavy lift drones will depend on the successful implementation of Light Cargo Delivery Drone as drone operations with heavy payloads are restricted by aviation authorities. In India, commercial drones operations are restricted and need special approvals from DGCA prior the flight. However, Indian UAV manufacturers are developing UAV prototypes, capable of lifting heavy payloads. For instance, In February 2019, Poeir Jets launches Heavy-lift Hybrid Drone with MTOW of 200 Kgs to be used for Cargo, Civil, Agriculture, Forestry, Defence and other strategic applications. Neighboring countries such as China and Malaysia are developing UAVs with MTOW capacity ranging from 800 Kgs to 5000 Kgs to be used for various commercial & military applications. Irrespective of the development in UAV industry, the growth of heavy lift drones market is subject to the regulatory approvals by the concerned aviation authorities.